Made with aramid fiber, the EBC GreenStuff 7000 Series deliver powerful stopping and less dust plus totally silent braking with their new triple layer wolverine shims, chamfered and slotted construction. 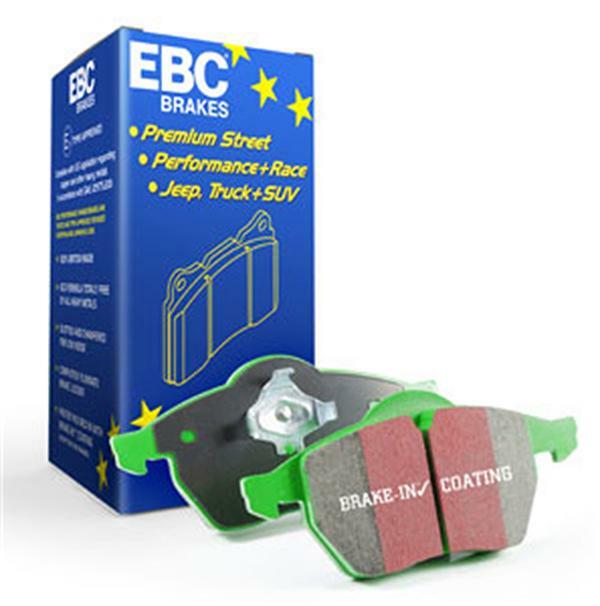 EBC Brake- in surface coating applied on all pads to ensure fast pad bed in and perfect brakes right from installation. EBC medium dust fast street pad with 20-25% % brake improvement. Capable of repeated heavy brake use without brake “Fall-Off”. Very minimal disc/rotor damage characteristics. Superb material for lighter model Asian and European sport compacts. ECE R 90 type approved for most cars. Features red “brake in’ surface coating for instant safe braking after install.